I don’t generally do a big Thanksgiving dinner here. It’s sorta self-defeating to cook a turkey with all the trimmings, then sit and eat it by myself while my wife has a bean loaf with salad. This year, however, I had big plans. We invited some friends over for dinner on the Saturday after Thanksgiving to have a full, traditional Thanksgiving Day dinner. It had to be the weekend because, you know, some people work. (On the real Thanksgiving, I don’t think we had anything for dinner because we didn’t have a kitchen—more on that later). The meal was to include—in addition to the main attractions of turkey, stuffing, gravy, roast potatoes and cranberry sauce—the traditional beans with slivered almonds, creamed corn, corn bread and pumpkin pie. Since many of these foods are unfamiliar to Brits, I thought this would be a great introduction to American cuisine. It also promised to be agreeably humorous, as the uninitiated’s initial reaction to creamed corn is generally incredulity followed by confusion. As so, as The Day approached, we gathered all the necessary ingredients, and then found ourselves without a kitchen. This wasn’t alarming, as it was something planned. What was not planned, however, was for the kitchen to be unavailable for a second day. This meant we couldn’t begin cooking the corn bread or pumpkin pie, so we had to call those off. I also canceled the green beans with slivered almonds because it would have been more effort than it was worth. No one would have eaten it; it would have received a bit of curious poking, then gone into the bin, so I decided there wasn’t enough comic potential to make it worthwhile. The meal was now turning into more of a Sunday Roast than a special T-Day Dinner, but at least we still had the cranberry sauce and the creamed corn. Then the kitchen was out of commission for a third day. This was the day of The Meal, and we were scrambling to figure out how to get it done on time. The kitchen itself was complete, sort of, but when we turned on the oven, it didn’t work. This came as a surprise, as the oven had not been touched during the disruption to the kitchen. We weren’t too worried, as the Kitchen Guys were due to come back that morning to clean up. However, they were not coming until 11:00 and there was no way to get a turkey dinner cooked before the guests arrived. Our only option was to push dinner back by an hour. Then, to our joy, the Kitchen Guys arrived early. They got to work straight away, and pulled out the oven to check the wiring. And the electricity went out. We called our friends and explained the situation. They offered to cancel, but we told them that, at the very least, we had wine and cheesecake, so they came over any way. In the meantime, my wife nipped to the Co-Op next door and bought cold cuts, cheese, crackers, olives, veggies and dip, and managed to whip up a holiday buffet. Oh, and candles, she also bought candles. A candle-lit Thanksgiving Day Buffet. 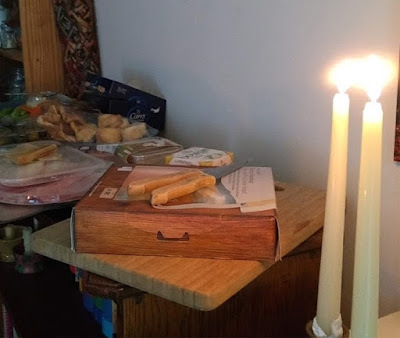 So, our guests arrived and we had a lovely, candle lit meal—with wine—and cheese cake for dessert. When the electricity finally came back on, we toasted the light with whiskey and settled down to a long game of Trivial Pursuit—Baby Boomer Edition. The coup de grâce to any hope of having a turkey dinner came when we realized we would be too busy this coming week to be able to cook the thawed-out turkey breast waiting in the ‘fridge, so, many empty wine bottles later, our guests departed in a taxi, along with the holiday turkey and a box of stuffing. Despite that, it turned out to be the most enjoyable Thanksgiving I have spent here, and it was certainly the best one I have ever experienced that didn’t involve a turkey. 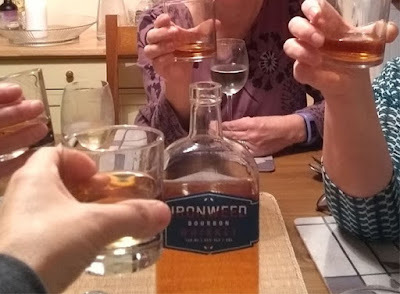 A toast, to good friends, good food, and an uninterrupted supply of electricity.